Lio Rush likes to talk a lot and he’s very good at it too. Sometimes he can get a little ahead of himself and when Emma was released by WWE, he found himself in the middle of a storm of judgement. When Emma (now known as Tenille Dashwood) was released from WWE she had just come off of a two-match series against Asuka. She lost both matches, but did her job well. Then she was released and it was a pretty big surprise because being Asuka’s first opponent on the main roster was something that a lot of women were vying for. 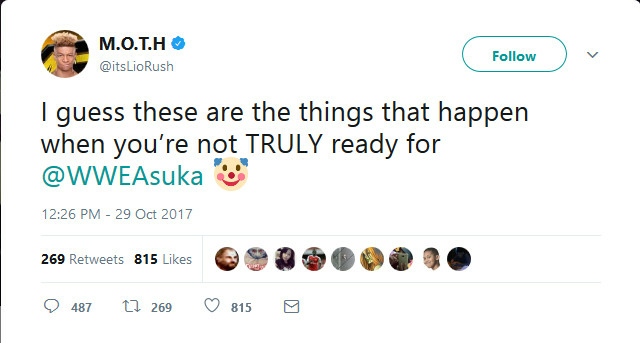 Rush said that he didn’t think it was a big deal at the time and decided to leave the tweet up in spite of advise to take it down. “It hit me so fast and hard I remember I was sitting at a Waffle House when I tweeted that out. I didn’t even mean it in the slightest way to be hurtful or anything. The reaction to Lio Rush’s tweet was pretty scathing throughout the IWC. Tenille Dashwood has a large and passionate fan base who were not pleased. On top of that he was making a joke about someone losing their job. “It isn’t like I am bashing her or anything like that. Then I started seeing hundreds of comments and then thousands of comments and people just raining down on me and I was thinking, man, I messed up really bad, really, really bad. So it sounds like everything was mended and there is no heat in the situation anymore. At the time of his tweet, Lio Rush was just starting his journey as a WWE Superstar in NXT and wasn’t even on their television show. He avoided a huge bullet for handling the situation appropriately.